Everyone loves free things. How can you not? It’s free! So of course, when it comes to the mobile gaming market, free-to-play games currently rule the roost. But for developers of those free-to-play games who are competing with hundreds like it everyday? It can very tough to see a return. Which is why many mobile developers are turning to in-game advertising to monetize their apps. Some free-to-play audiences are more accepting of in-game ads than they are of microtransactions. However, ads that seriously interfere with a user’s experience can turn them off your game for good. And if others are willing to make an in-app purchase, the last thing you want to do is scare them off with ads. There are many variables to consider when monetizing your F2P games, especially if you want to avoid having a negative effect on retention and user reviews. It can be hard to strike the right balance. 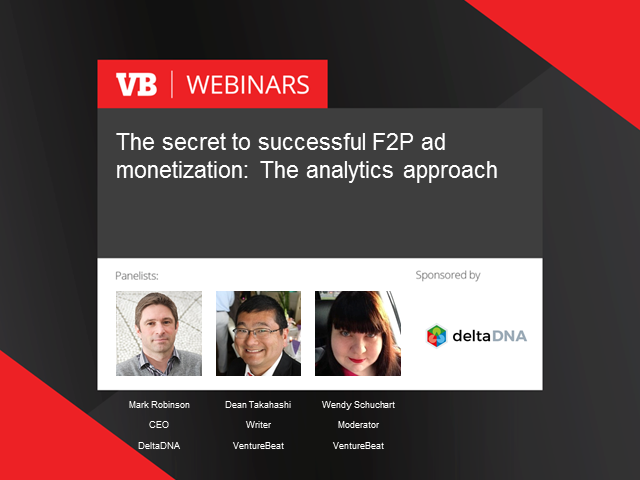 In this webinar, DeltaDNA CEO Mark Robinson will be sharing the findings of their recent survey into in-game advertising and chatting with VentureBeat's Dean Takahashi about the state of the gaming industry. DeltaDNA questioned game developers about their most successful F2P games, discovering their concerns, thoughts for the future, and advice on best practice. You’ll hear about the strategies that are working, and discover some insider secrets on how to successfully monetize your game without upsetting players. *Discover the brand-new insights generated from this survey. *Find out the strategies that successful games are using to monetize. *Learn what games are doing in different genres and with different player types, from indie to major. *How to balance and improve player retention, monetization, and game ratings using intelligent player targeting, powered by deep data.